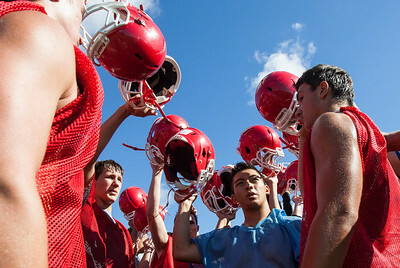 Kyle Grillot - kgrillot@shawmedia.com Varsity football players prepare for an exercise during the first day of practice at Cary-Grove High School Wednesday, August 14, 2013. 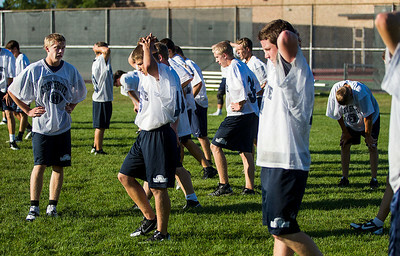 Kyle Grillot - kgrillot@shawmedia.com Players attempt to catch their breath after running sprints during the first day of practice at Cary-Grove High School Wednesday, August 14, 2013. 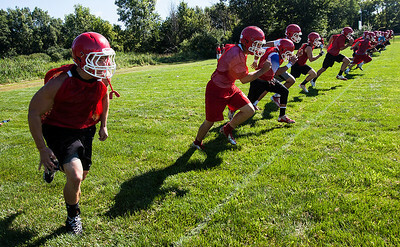 Kyle Grillot - kgrillot@shawmedia.com Players run sprints during the first day of practice at Cary-Grove High School Wednesday, August 14, 2013. Ruthie Hauge - For Shaw Media Quarterback, Brett Covalt, a junior, runs a play during a drill at the first varsity football practice of the new season at Prairie Ridge High School in Crystal Lake, on Wednesday, August 14, 2013. 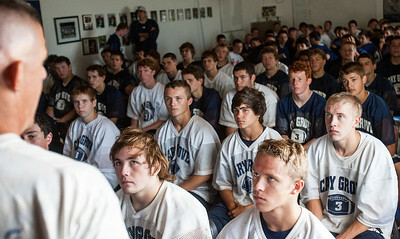 Kyle Grillot - kgrillot@shawmedia.com Cary-Grove football players listen to head coach Brad Seaburg speak during the first day of practice at Cary-Grove High School Wednesday, August 14, 2013. Ruthie Hauge - For Shaw Media Quarterback, Brett Covalt, a junior, calls out a play during a drill at the first varsity football practice of the new season at Prairie Ridge High School in Crystal Lake, on Wednesday, August 14, 2013. Ruthie Hauge - For Shaw Media Head Coach, Chris Schremp, demonstrates a drill for players during the first varsity football practice of the new season at Prairie Ridge High School in Crystal Lake, on Wednesday, August 14, 2013. Ruthie Hauge - For Shaw Media Senior Running Back, Steven Ladd, runs through an agility drill during the first varsity football practice of the new season at Prairie Ridge High School in Crystal Lake, on Wednesday, August 14, 2013. 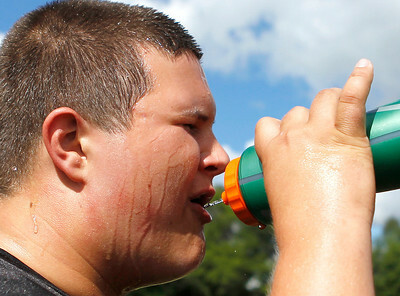 Ruthie Hauge - For Shaw Media Sophomore, Luke Ponga, takes a water break with his teammates during the first varsity football practice of the new season at Prairie Ridge High School in Crystal Lake, on Wednesday, August 14, 2013. 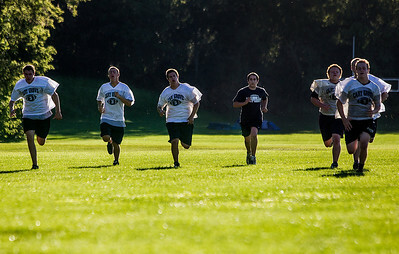 Ruthie Hauge - For Shaw Media Seniors, Ben Mack and Harry Hillman and Dereck Pearson run through offensive drills using a football sled during the first varsity football practice of the new season at Prairie Ridge High School in Crystal Lake, on Wednesday, August 14, 2013. 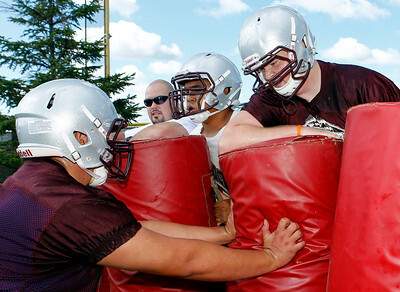 Ruthie Hauge - For Shaw Media Assistant Coach, Dave Hartl (cq), senior, Shane Evans, and junior, Chris Dolleton hold tackling dummies as other players push into them during the first varsity football practice of the new season at Prairie Ridge High School in Crystal Lake, on Wednesday, August 14, 2013. 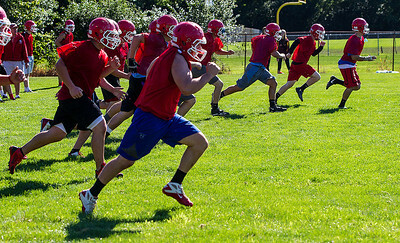 Kyle Grillot - kgrillot@shawmedia.com Varsity football players run sprints during the first day of practice at Marian Central High School Wednesday, August 14, 2013. Kyle Grillot - kgrillot@shawmedia.com The Marian Cenral Varsity team says a prayer to conclude their first practice of day at Marian Central High School Wednesday, August 14, 2013. Kyle Grillot - kgrillot@shawmedia.com The Marian Cenral Varsity leaves the practice field after concluding their first practice of day at Marian Central High School Wednesday, August 14, 2013. 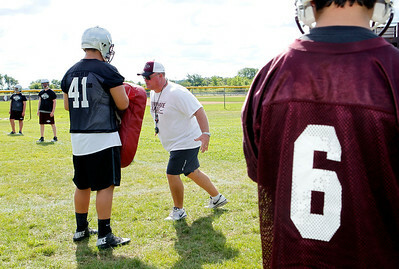 Head Coach, Chris Schremp, demonstrates a drill for players during the first varsity football practice of the new season at Prairie Ridge High School in Crystal Lake, on Wednesday, August 14, 2013.